Go on. Eat just one. 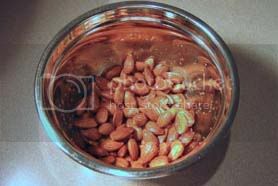 1 Stir tamari with almonds and marinate at room temperature for approximately 2 hours or until any puddling at the bottom of the bowl evaporates. Note: Tamari is a naturally brewed sauce made traditionally from water, whole soybeans, and salt. Shoyu is a similarly brewed sauce made from water, soybeans, salt, and roasted wheat. Either can be used in this recipe; however tamari has a more pungent flavor that better complements the roasted nut. Avoid use of commercial, chemically processed "soy sauce". It's known to contain caramel color, hydrochloric acid, sugar, and hexane, a petroleum derivative used to defat the soybeans. Yum. 2 Preheat over to 330°F. 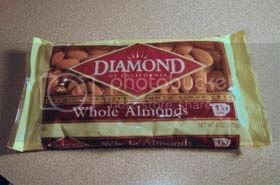 3 Toss tamari-soaked almonds with kosher salt and spread in a single layer on a baking sheet. Note: Lining the baking sheet with aluminum foil will reduce cleanup time. 4 Bake for 10-15 minutes, stirring every 4 minutes. 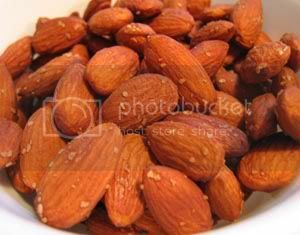 Note: At 8 or 9 minutes the almonds will just begin to brown on the inside. At 15 minutes their insides will be quite toasted. 5 Cool at room temperature for 30 minutes. Store in an airtight container in the refrigerator. I make these often and I love them. This time I've tried adding a little bit of balsamic vinegar so we'll see how they turn out. Received a link to this last month! I've made so many batches since then! Thanks for sharing.